Thesis Theme 2.0 Framework for WordPress is launching on October 1,you can Upgrade or Download Thesis 2 Theme on the releases date as mentioned by Chris Pearson in one of his tweets. It is really exciting moment for all Thesis Theme Users, even I am very curious to have my hands-on on Thesis Theme 2 .0 on this blog. DesignSkew is already running on the most famous Thesis Framework, and it will great to redesign the blog with Thesis 2. This post is all about the upcoming thesis theme for wordpress, including upcoming features, release date which I mentioned above, pricing structure and whats new in it. Here’s the tweet by Chris Pearson made yesterday, a lot of queries are running after that tweet, asking price structure, teaser images, and much more. Even for making some more excitements and network, see above what Pearson tweeted mentioning someone’s tweet, probably a Thesis fan. Everyone is excited to see whats going to be released on October 1. As mentioned by Chris Pearson, the Thesis 2 WordPress Theme is already developed, and they are giving it final touch, so there will not be any betas of the theme. And while this was going on yesterday, Chris unveiled another post on DIY Themes about the upcoming Thesis 2.0, and I am sure its going to be a big hit. I remember when he released Thesis WordPress Theme, he ensured the standard premium theme quality mentioning Thesis Theme, and now he says he reinvented the wordpress themes, it seems Thesis 2 is going to be a sensation in the world of WordPress Themes. He said in his post, recoded the whole engine, means you will get best SEO features. Release Date, is it Confirmed ? What happened previously is rumored everywhere that Thesis 2 will be live in the month of August only, after an update from Chris Pearson, the creator of Thesis theme. Though, it couldn’t be up according to the time he mentioned. October 1, he Tweets yesterday. And yes, this time, its confirmed. It is confirmed because he published the Version 2 Teaser blog post on DIY Themes. And second time, he again tweeted the same date, saying “if you are aware of, Thesis is going to release on October 1“. What’s New in Thesis Theme 2.0 ? Not one, not two, a lot of new features we are going to see in Thesis 2.0, not every feature is unveiled yet, I believe. Though on the Official Version 2 Teaser, there are some of the features exposed which I am going to list here. Yes just like what we have in Headway Themes, Thesis will be running on Drag and Drop Functionality, announces Pearson in one of his tweets. He haven’t revealed what exactly the feature will be, but it has something to do with the new Thesis Boxes. It could be like, creating custom boxes anywhere in the theme and drag and drop the boxes anywhere, and using hooks, these boxes will be displayed on the desired positions. Chris promises its hell easy to manage and customize Thesis 2.0 Theme, so it is definitely User Interface of Hooks which everyone can use for sure. I don’t know what he meany by saying “experienced designer absolute rockstars“. 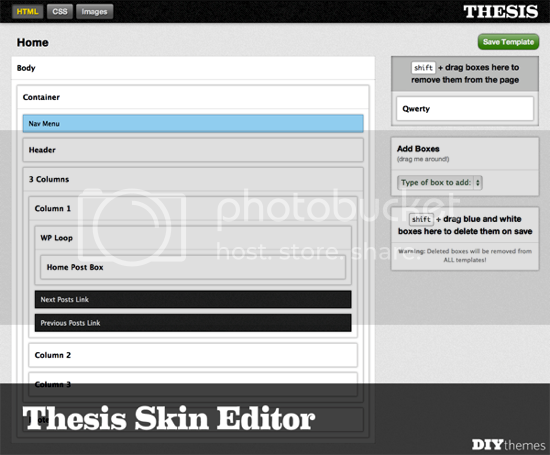 All new is Thesis Skins Editor, which will now work for beginners and novices too, apart from Developers. Previously, Thesis WordPress Theme used Custom Functions and Custom Style-sheets, in the form of custom.css and custom_functions.php, but Thesis 2.0 will be having a whole different thing. Thesis Skins Editor is all new way to Manage Custom Hooks and Filters, all that visually from your Dashboard I believe. Ultimately, it would be easy for Users to customize the Design. You can see in the above screenshot, its the whole map of wrapped elements from the Container to the WordPress Posts Loop. So, you can customize each and everything right from this panel, select the element you want to Change or Customize, and then alter its Design options. This is made really easy, great idea. This is again useful option for users, deploying all your CSS Customization from scratch, without writing code. Thesis Packages is all about customizing and deploying the CSS Style-sheet for your blog effectively and efficiently using User Interface on your Dashboard. No more custom.css this time, control all your style-sheets from Dashboard, edit them and create new styles. Whats better than this, if you can write your CSS without actually writing it, using Thesis Packages. Thesis Theme 2.0 for WordPress will be costing around $197 for Developers, I mean Unlimited License, just after the release. And those, who already have a Thesis Developer License now, you will get free upgrade to Thesis 2.0. Not only this, if you are having Thesis Personal License now, you will need to pay around $77 to get Thesis 2.0, so you guys better upgrade to Developer License now. So, if you buy Thesis Developer License now, you will get Thesis 2.0 for free, you can save $33 if you buy a license from below.